If you haven't packed away your holiday items yet, now is the time to do it! 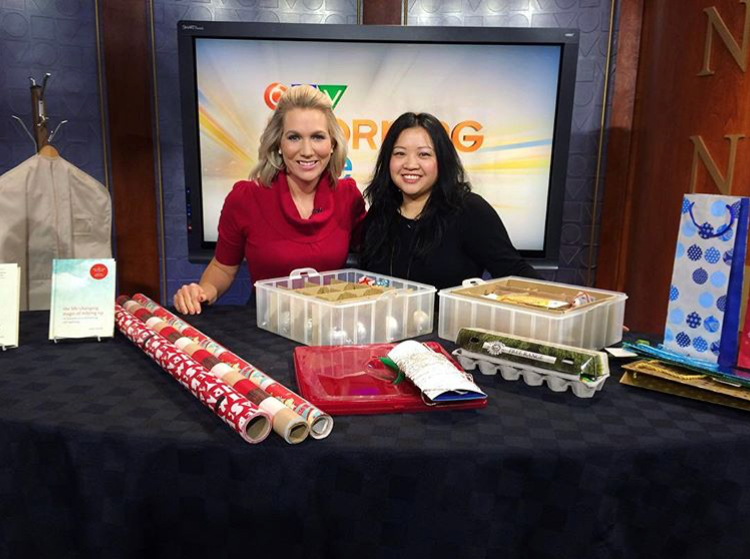 I was on CTV Morning Live to share some organizational tips earlier today. Here is the segment if you missed it and I hope you find these tips helpful in your home. Before you start, check your storage to see if there are any other holiday items you didn't use this year. Be honest and ask yourself, does it still spark joy for you? If it doesn't, it's time to thank the item since it has fulfilled its purposes and let it go so it can spark joy for someone else. Don't automatically put everything that is out on display back in storage. Just because you used it this year, doesn't mean you love it. Ask yourself if each item sparks joy for you and if you're looking forward to use it again next year. The best way to store gift bags are inside other gift bags. I like this method because it's easy and simple. Everything is together and easy to find when you need it. Tissue paper can take up a lot of room when it's not properly folded - That's why they're used to fill the space inside gift bags and boxes! If you want to maximize your storage space, fold it and store them all together so it's easy to access when you need it. You can even store them with your gift bags! There are so many organizational products designed specifically for holiday items but it's not a one size fits all solution. I find the best organizational items to use are shoe boxes. I use them everywhere! When it comes to protecting fragile ornaments, you can reuse and repurpose things you already have. Egg cartons are great for smaller ornaments. You can also create compartments in your storage boxes using cardboard. Reuse bubble wrap or bubble envelopes you receive in packages for an extra protective layer. Nothing is more frustrating than trying to untangle Christmas lights. Save yourself the headache and easily keep your Christmas lights untangled by wrapping it around a piece of cardboard. I fold my cardboard to create a tube to wrap my Christmas lights around and tape the two ends in the middle of the tube so it's easy to unravel next year. If you noticed a Christmas light bulb needs replacing or a holiday item needs repair; replace and repair it before storing it for next year. Your future self will thank you. Wrapping paper are generally hard to store. They can flop all over the place and aren't uniform in size. A great way to store them is putting them upright inside garment bags. This way you can hang them in your closet and it doesn't take up more room than a coat. it can be tempting to stockpile more holiday items at the end of the season when everything goes on clearance. Resist the temptation and don't let the price decide your purchase. You won't need those items for a year and your taste might change by then. Which of these tips will you try? Let me know in the comments!